Model 60 Electric Scooter Can You Handle the Beast? The E-Rider Model 60 is quite simply the most powerful, exhilarating and stylish electric scooter you can drive on UK roads. It represents the ideal choice for thrill-seekers looking to reduce their carbon footprint, fuel expenditure and through-life costs, while still retaining full power and all the joys of riding a motorcycle. The bike is equipped with a 6000W motor that propels you from 0-60 in no time at all, and has a top speed of 100kmph. The Model 60’s 72V 60Ah LiFeP04 battery takes only four to five hours to reach a full charge and has an exceptional maximum range of 130km from a single charge, meaning you’ll never fall short on your commute. The sleek, all-black finish is matched by a state-of-the-art digital display, and the Model 60 has a maximum loading capacity of 150kg. In addition, the it runs off a simple twist-and-go throttle, meaning there’s no clutch, gears or noise – just silent, effortless power. All this combined with the Model 60’s speed and performance is what really makes this bike the beast. Of course, an electric scooter this powerful can’t be ridden by just anybody – it requires a motorcycle licence to drive, however the price does include registration. So if the Model 60 isn’t for you but you’re looking for more power than seen in our standard models, we recommend the Model 30 Moda electric mopeds, Special Edition or Model 30 City. 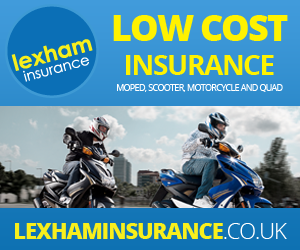 Reaching speeds of 30mph in only five seconds and looking fantastic on the roads, these electric bikes are perfect for those who haven’t yet undertaken full motorcycle training. We’re sure to have an electric bike or scooter that meets all your needs. See our full range of electric motorbikes and get £300 off any model for a limited time only in our big Winter Sale when you enter the code WINTER17 at the checkout.